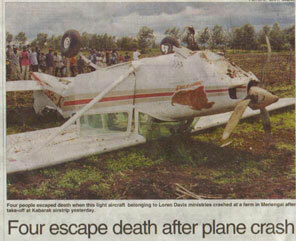 Our plane crashed Easter Sunday at 1:30 p.m. Kenya time. After getting airborne, things were proceeding normally and we were gaining altitude when suddenly the engine stopped. Loren used emergency measures to control the crash speed and avoided hitting a farm house and we crashed in a very small shamba (farm). The plane flipped on its back and Loren immediately turned off the fuel and broke open a door and pulled us all out. Since we were all upside down it was very difficult to get out of our seatbelts, but we thank God for them because they saved us from breaking our necks when the plane flipped over. We all have bad bruises from the seat belts and I had a slight dislocation of my left shoulder. At the time I thought it was broken but thankfully it was not. It was a miracle to get out and a bigger miracle when you see where we crashed. Since we were not far from the former President's home, his security men came in four wheel drive vehicles to rescue us and we were taken to the hospital within two hours. Loren had the most severe injuries because he hit his head on the dash and had to have stitches and got a really ugly black eye. Richard was in front with him and sustained injuries to his head also , although no cuts, and a badly sprained wrist and hand. 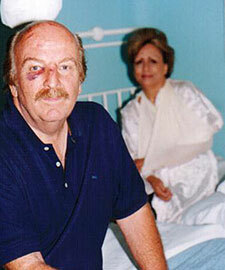 Catherine was seated behind Richard and sustained bruises to her head and right arm, though not severe. All of us were x-rayed and nothing was broken. Loren was kept for observation overnight for blood pressure. I stayed to be with him and they just wanted to watch me for shock. Richard and Catherine we realeased immediatly. We are so thankful no one was killed or seriously injured. No one on the ground was hurt or injured. We are so grateful not to have been in an even more desolate place when we went down. We have had a great outpouring of love to us here. People came from all over, we don't even know them , but they had heard of our work and knew us and people called from all over Kenya as well as the UK and America. Another missionary came yesterday to the hospital and said God had given him a verse for us. It is Isaiah 54:10. Please read it for yourselves , it will bless you. We left the hospital yesterday. Each day we feel stronger and also more places that hurt, but we are grateful that the God who raised Jesus from the dead, was also able to hide us in the palm of his hand as the enemy tried to kill us. After the initial investigation, the investigators believe the crankshaft failed which cause catastrophic engine failure. We have insurance, but it is not enough to replace the plane. But we serve Jehovah Jirah! The crash story was on all television stations by 9 pm Sunday night and stories and pictures have appeared in papers and on radio as well since it happened. It is a great testimony to Kenya of the delivering power of Jesus. People have been great and we have been encouraged at the outpouring of support. The American Embassy called us this morning to say "pole", sorry and to help us in any way we needed them. Loren has found a used four wheel drive vehicle and God spoke to a pastor who sent the money to buy it. We are now continuing our mission to Turkana and So. Sudan. Our 3 trucks and teams are now building 12 new churches in unreached villages. The devil is terrified of our work and does not want this new territory to be reached. Please continue to pray for us. This has been a real war! We love you all so very much and we are so grateful to have a praying family of partners. P.S. Click here if you want to plant a special gift for the work here in Africa. NOTE: If you want field reports via email, be sure to give us your email address at combineharvesting@hotmail.com.